This kind of post is something I’ve considered doing for a while, and now that I’ve had the time to marathon some shows recently I decided to go through with it. Basically, what I’ll be doing is these occasional posts on a selection of anime, games, or albums*, alternating between them from one post to another (so the next one will be games, then albums, then back to anime). 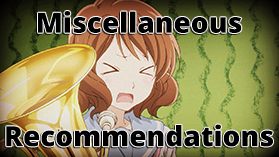 For this one, it will cover a few anime I’ve watched over the past month that I feel are worth talking about, but not particularly shows I want to write full reviews for.